Last month, HFC was host to four fellows from Medtronic’s Global Innovation Fellows (GIF) program. Medtronic Philanthropy is an important partner of HFC and because of this relationship, Medtronic selected HFC to be the host site for this worldwide program available to their employees. HFC was one of three sites selected to host this intensive three-week program, the other sites being in Indonesia and South Africa. The GIF team came to HFC from different corners of the globe, Fedor from Russia, Claudia from Brazil, Kannan from India, and Luis from Panama. Each derives from different sectors of Medtronic (sales, marketing, engineering, human relations) who applied for this fellowship and were selected from amongst Medtronic’s best and brightest employees. They were tasked to spent three weeks working with HFC staff and volunteers, with the goal of taking health care further together. The Global Innovation Fellows (GIF) program is a unique, short-term skilled volunteer opportunity that allows Medtronic top talent to develop additional leadership skills, address global health challenges, and interact with local communities using tools and skill sets built around human-centered design and innovations in health for the underserved. Fedor Suzdalev is the Senior Director of Medtronic’s Cardiovascular Group in Russia. He is a Mathematician and IT Specialist and joined Medtronic 14 years ago. Fedor is 45 years old. He and his wife Anna have three children ages 17, 12, and 9. Claudia Morgenthal is the corporate Human Resources Manager for Medtronic operations in Brazil. She strives to improve the corporate working environment by finding the balance of respecting the person while protecting the company. She has a degree in business with a Master’s in Business Management. Claudia came to work for Medtronic 3 ½ years ago, when they acquired Covidien, a company she was working for at the time. She is married and has a 6-year-old son. Kannan Kase is the Senior Manager of Engineering in Hyderabad, India. He and his group design surgical devices. Kannan is a degreed Engineer and has worked for Medtronic for 6 years. He and his wife, Surya, have a 6-year-old son. He observed that “the employees and volunteers seem for feel connected to the mission. Everyone connected with HealthFinders is trying to make a positive impact.” Kannan further stated, “even though HealthFinders is a non-profit, it is very professional with good plan priorities and great leadership”. Luis Perez Rivera is a Regional Product Manager for Medtronic in Panama. His group focuses on renal care solutions for patients with kidney disease. Luis has been with Medtronic for 2 years. He is married, has 2 children, and is a rescue diver in his spare time. When asked of his impression of HealthFinders, Luis said, “impressive, the staff and volunteers are passionate about making a difference. HFC has a unique care model. It is exciting to see how you are working with diabetic patients.” He sees HealthFinders greatest strength as “your capacity to be more flexible, you are implementing a very innovative model of community-based care which takes into account the patient’s environment, their family and their home, a truly holistic point of view”. 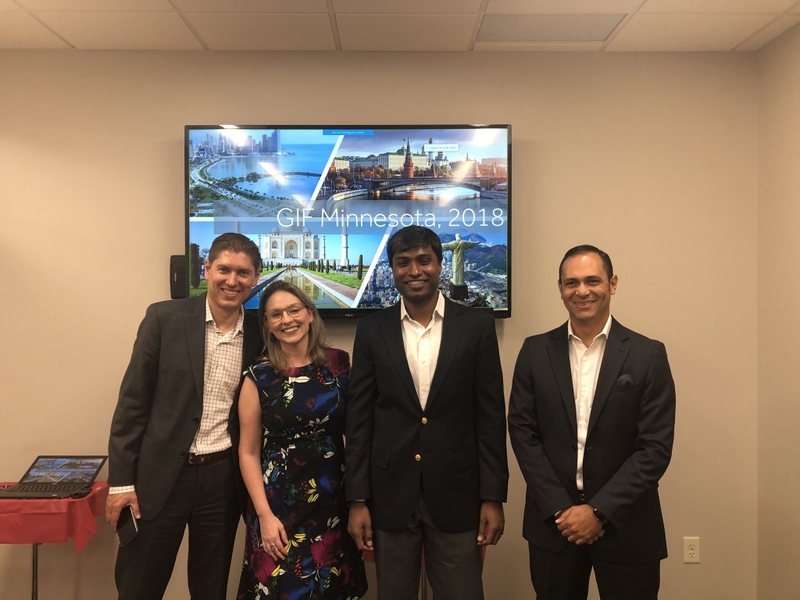 HFC is deeply grateful to Medtronic for sharing their GIF team with us and we are so thankful to Claudia, Fedor, Luis, and Kannan for sacrificing their family time to share their gifts and talents with HFC. We all started this project as hopeful strangers and ended as friends committed to ensuring healthcare access for everyone. Stay tuned for more information about the project process and outcomes.